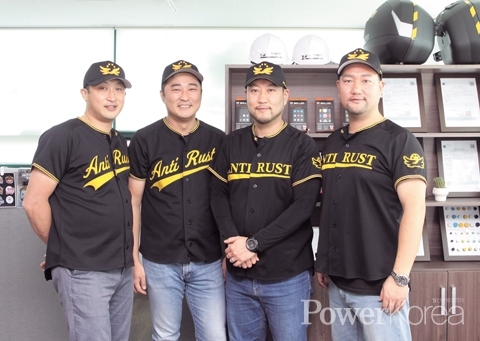 Anti-Rust Korea is an anti-rust solutions specialist that has introduced rust-less parts for many years through continuous R&D. The rust and corrosion can be serious problems as they can cause accidents. Also, the substances of rusted and corroded parts can produce secondary pollutants by photochemistry reactions in the air and can harm our health directly or indirectly. "Rust is made through reaction of oxygen, moisture and carbon dioxide in the air. But it is difficult to prevent it when it comes to parts such as bolts and nuts. I focused on this and spent a considerable amount of time to find the necessary technique. Thus introduced was BOLLOD made by using 'galvanic anode', the rust proofing technology" says Lee. BOLLOD is anti-rust bolts developed by Anti-Rust Korea. It is offered in 6 colors in bolt caps: gold, silver, pink, black, blue and red which makes them look good. The surface is covered with reflective sticker so that we can even recognize them in low light. Its application is vast from motor cycles, bicycles and cars to equipment used for construction, shipbuilding, pence, bridge, weapons and industrial plants. Despite this innovation in anti-rust and good design, the price is rather rational than you might imagine. This patented BOLLOD was approved by the Korea Testing & Research Institute. Lee received support from the Korea Technology Finance Corporation and finished the 18 month young startup academy course. He also won the grand prize at the item-related project presentation through the screening by the judges. As the CEO of Anti-Rust Korea as well as a technology innovator, Lee is determined to make a contribution to building safer Korea by producing safer industrial parts.